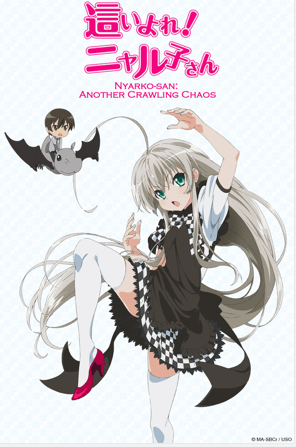 The pitch for the light novels that the Nyaruko-san franchise is based on must have been simple: “what if the Elder Gods of the Cthulu mythos were otaku, moe schoolgirls—oh, except for the trap?”Anyone who knows anything about HP Lovecraft’s work ought to have recoiled from such a proposal. And yet, here we are, with two Flash-animated series and now this fully-animated, Xebec-produced, anime, Haiyore! Nyaruko-san based on this premise. And, shock and horror: it works. I came to Nyaruko-san with only a glancing familiarity with the Cthulu mythos, primarily from having played a few short campaigns of the Call of Cthulu tabletop RPG with my high school buddies. So I got the SAN points references, and that most of the Cthulu knowledge actually came from the game than from the books. I didn’t get much else, and from what I’ve seen, this series is full of references, not just to Lovecraft’s sprawling mythos but to all corners of otaku culture too. What was refreshing is that I didn’t need to get everything to enjoy the show: the slapstick humor, the quick and energetic pacing, and above all the refusal of the show to take itself seriously made it a laugh-out-loud watch. I can only think of two or three moments where there is a touch of actual emotional sincerity not immediately undone by a joke—and that was enough. Any more and it would have simply been mawkish. That Haiyore! Nyaruko-san works is also surprising given how insular and very otaku-centric it is. Ever since Haruhi Suzumiya appeared on the scene, anime has taken a lurch toward the meta, the otaku-pandering, and the niche. In this series, the Elder Gods are all otaku, in love with eroge, RPGs, and anime. Huge, world-threatening monsters are often after nothing more—or less, depending on your perspective—than otaku entertainment, which the aliens think actually is the whole of “Earth entertainment.” One episode even features an unsubtle piece of contemporary political satire, lampooning certain Tokyo politicians who would censor manga and anime. Most of time, I no longer find this sort of thing funny. Why is this a seeming exception? It helps to have fun with the cliches even when you’re using them. Aside from getting the basics of comedy right—fast pace, great comic timing (see all the moments when Kuuko and Hastur make their advances on Mahiro in reaction or in tandem with Nyaruko), and a lack of pretentiousness—it’s the contrast between the high and low that makes it work. Lovecraft’s mythos was intended to convey the terror of huge, unknown forces and beings outside of human control—to restore a kind of religious shock and awe that Lovecraft felt was missing from modern man. To find out that these beings are…just running a theme park, and love nothing more than a stupid eroge? See, that’s funny. It cuts at the pretension that was never far from Lovecraft’s work, and nods at the fact that otaku entertainment is, in the grand scheme of things, kind of trivial. And this is not hard to understand, even if you miss the specific references. The buffoonery of all the characters is universal. Haiyore! Nyaruko-san was my “easy to watch” dumb fun show of the season. It didn’t pretend to be anything more than that, and that was enough. This is one of the season’s unexpected winners. This show was like Gintama, full of references, a gag anime rather than a story. I think some episodes were interesting. But just like Gintama, I didn’t follow. Characters were really cute though. I just loved the OP. U~Nya~! It was probably the most unique and moetic song of the season. I figured out the chords, so I can play this song. Lol, that OP’s chords must have been a challenge. Not sure I can play along on the keyboard with that, I’d like to hear you play it sometime :) But as for the show itself it was indeed cute, and for me the references didn’t get that much in the way, though I can understand how they might for many viewers. It’s not a show I can recommend to general audiences really, it’s definitely for otaku. The dating sim episode was hilarious but probably not understandable to anyone unfamiliar with anime post 2006…maybe I did get a lot more of it than I consciously realized. Haha, the chord progression sounds unconventional, but it’s not that complicated when I figured the chords. I suggested Mikarin to sing this song, and she was laughing. Yes, meta-talk is not that interesting to me, Gintama too, I get the references, but I like to see more of the original narratives.